Jacquard knitting—by hand‽ (that’s an interrobang, by the way, a new addition to my typographic arsenal, although it doesn’t seem to display properly in Internet Explorer). It’s also a pair of inter-locking, italic J’s (Centaur font, Italic Swash Caps). Centaur is a 20th century font designed by Bruce Rogers, but based on the designs of a famous “J”: Nicolas Jenson, the celebrated 15th-century French typographer active in Venice. 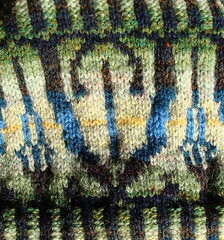 The point of this little design “problem” was to see if I could come up with a pattern that used the key features of jacquard knitting: reversibility, and stranding. 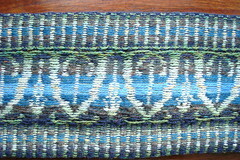 Truly reversible jacquard knitting can only really be done on a machine (humans have but two hands, after all), but stranding does allow the hand knitter to come up with a pretty close approximation of a reversible, knit fabric. 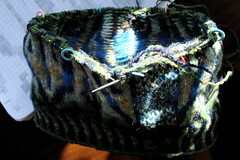 That’s actually not completely true: I believe there is a way to use a sort of mosaic technique to produce a reversible, stockinette-like fabric. I just don’t know how to do it. Jacquard is named for the jacquard loom, a punchcard- controlled loom that helped automate weaving in the early nineteenth century. Its main feature was its ability to mass-produce—it allowed manufacturers to churn out great quantities of figured fabric (especially, difficult silks) without having to rely on weaving skills their workers may or may not have possessed. 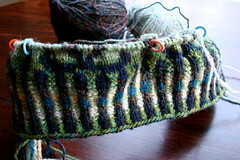 But back to this project: because I couldn’t resist the opportunity, I threw in some Fair Isle attributes: Shetland yarn, gauge of 8 stitches to the inch, colors that “peak” in the center row, corrugated ribbing, knitting in the round with a steek to bridge between rows and color changes, and no more than two colors per row. 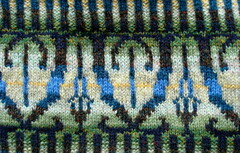 Since the gauge is 8 stitches per inch, floats only need to be woven in if a color is used less than once in 8 stitches. I designed a pattern repeat that required color changes every 8 stitches or less so that the whole thing would be (in effect) reversible. Here’s another look at the “lettered” design, which I call “J Nouveau”, because the design looks very art nouveau to me. In the beginning, we have a J that looks like this (left). 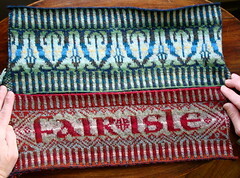 I’m planning to combine this with my Fair Isle sampler (it’s more or less the same size) and make a bag. Stay tuned! I love the way you present your samplers. Wow, I am in awe. 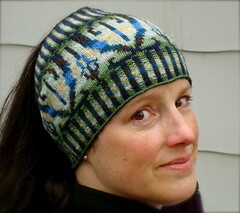 Maybe, just maybe, if I pay close enough attention, I'll get an idea how to combine Linda Hendrickson's "Please weave a message" with knitting, using some of your samples as inspiration! I'm particularly in love with the uncial font, for some reason. Gorgeous! 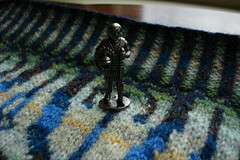 Do I see a Fair Isle book in the future (hint, hint)?